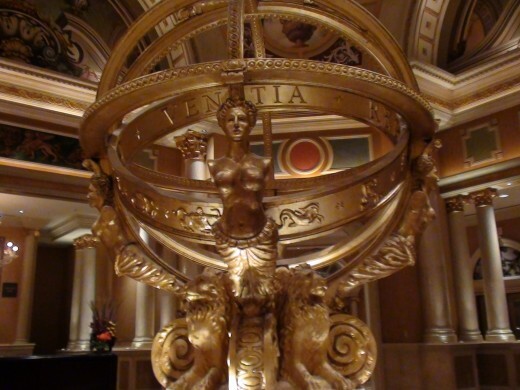 The Venetian is one of the more popular hotels and casinos on The Strip in Las Vegas and that is no suprise. If you ever get the chance to visit you will definitely not be disappointed. Even if you don't stay in one the suites in the hotel, you can still visit the resort and casino. One of the best parts of staying at (or visiting) The Venetian is that it's central to just about everything. 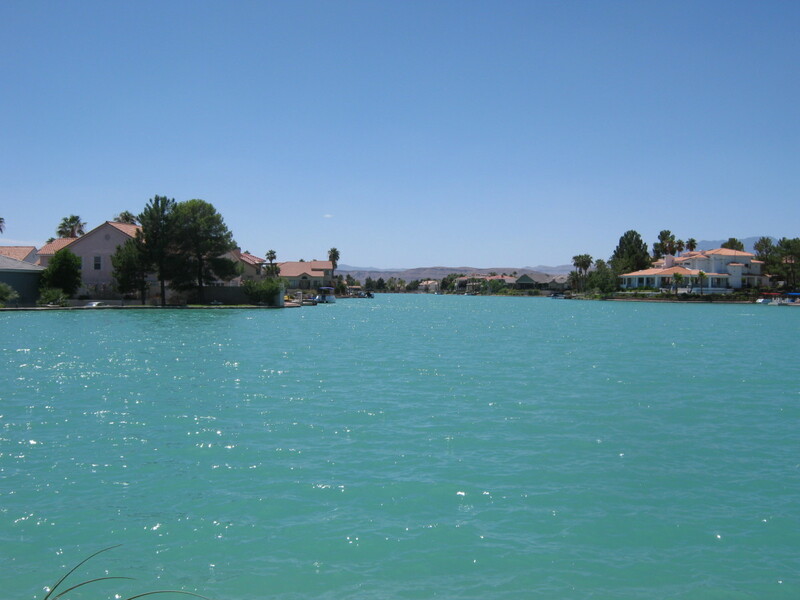 It's located right in the heart of the Las Vegas strip so, if you actually wanted to venture away from the resort, you don't have to travel very far to wherever it is you want to go. However, with everything this place has to offer, you probably won't want to leave very often. 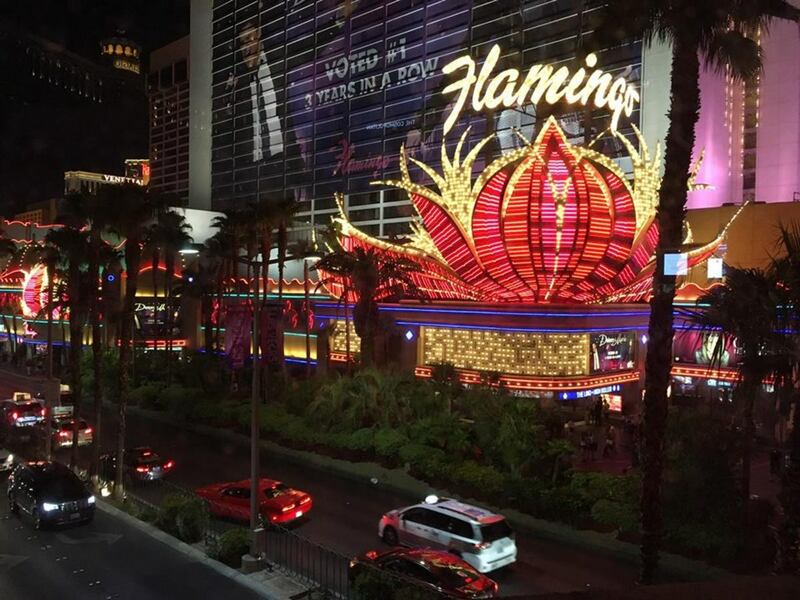 The Venetian also connects to the Palazzo hotel and casino so you can easily walk back and forth between the two. The Venetian is even more gorgeous on the inside than it is on the outside. Every inch of this gigantic masterpiece contains stunning artwork, architecture, and sculptures. 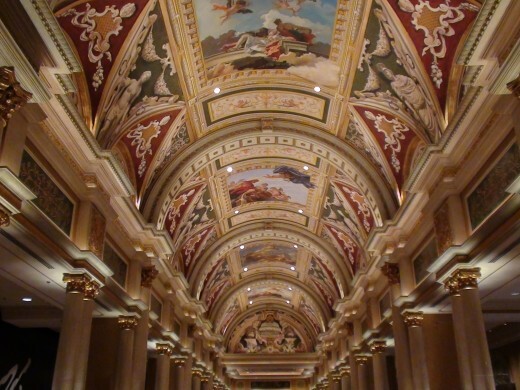 Check out the ceiling for a one-of-a-kind mural that will take your breath away. Like I stated earlier, you don't even have to be a guest in one of the suites to enjoy the stunning beauty of The Venetian. There are a lot of beautiful hotels and attractions in Las Vegas and this one fits right up there at the top. I'm sure that visitors who frequent Vegas and have previosuly stayed at The Venetian return time and time again. Artwork on the ceiling of The Venetian. 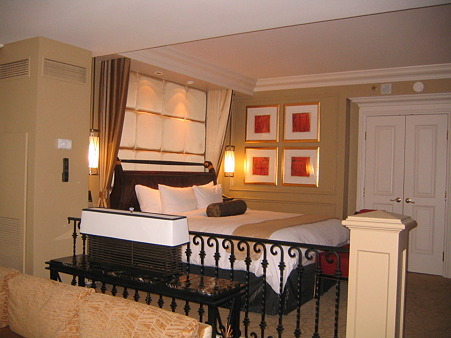 The Venetian hotel and resort offers suites to accomodate its guests. It is one of Vegas' all-suite hotels. The suites are stunning and feature beautiful, Venice-inspired bathrooms, living rooms, and sleeping areas. You may not have the best view out of your window, but the decor is amazing. There are a number of Venetian suites to choose from ranging is size from 650 sq. feet to 2900 sq. feet. The Accesible Suites also offer a number of options and are designed for individuals with a variety of needs. The Venetian has an amazing assortment of dining options. Regardless of what you're in the mood to eat, you'll be sure to find exactly what you're looking for. Whatever you end up choosing, you will not be disappointed. Aside from in-room and poolside dining, the Venetian features amazing casual and fine dining. AquaKnox: Mostly seafood with other delicious dishes from Chef Tom Moloney. Bouchon: A French restaurant with an array of first class dishes. Canaletto: A glorious Venetian menu from Chef Gianpaolo Putzu. Delmonico Steakhouse: An amazing steakhouse with a New Orlean's cuisine that's owned an operated by none other than Chef Emeril Lagasse. Pinot Brasserie: A California-French cuisine featuring fine seafood, steaks, and a fantastic selection of wines. Postrio Bar & Grill: A bark and grill menu with a modern twist from Chef Wolfgang Puck. TAO: Not only does Tao house an amazing nightclub, it also features a fantastic Asian bistro composed of delicious Chinese, Japanese, and Thai dishes. Valentino: A multiple award-winning restaurant featuring an Italian cuisine from Piero Selvaggio. Zeffirino: Named after Zeffirino Belloni, this restaurant offers an exquisite Italian cuisine. Visitors can enjoy a view of the beautiful canal as they dine. Cafe Presse: Offers coffee, smoothies, sandwiches, salads, and small snacks. Grand Lux Cafe: The menu features a variety of options including pizza, sandwiches, steaks, burgers, seafood, and a huge selection of desserts. It even has a bakery where you can purchase items to take with you. The Grill at Valentino: An Italian cuisine with everything from pastas to sandwiches, and a variety of desserts from Chef Luciano Pellegrini. Noodle Asia: Not quite fast food, but you can enjoy a quick meal at this noodle house that features an array of noodle and vegetarian dishes among other Asian favorites. Otto Enoteca: Offers an Italian cuisine with a casual dining experience from Chefs Mario Batali and Joe Bastianich. Public House: Gourmet pub food with an assortment of beer, wine, and spirits. Taqueria Canonita: A Mexican menu with a variety of absolutely delicious dishes. Tintoretto Bakery: Coffees, pastries, pastas, and scrumptious snacks. Trattoria Reggiano: A street side cafe experience with pastas, pizza, and other Italian dishes . The Venetian also offers a number of other small eateries and drink shops around the casino area as well as the shopping area. Needless to say, you will never starve and you can find just about anything you want within mere footsteps of wherever you are at any given time. If you're hungry but don't feel like going out to eat, the in-room dining menu is a great choice. There are multiple options and the dishes are nicely sized. Don't order too much or you might not finish it. Shopping at The Venetian is extraordinary. You can find pretty much anything you could possibly want or need in one of the many shops and stands. Customers can find jewelry, clothing, gifts, cosmetics, magazines, toiletries, candy, and everything in between. Like I stated earlier, you never even have to leave the resort because it has absolutely everything. The Venetian casino has something for everyone. Whether you're an experienced gambler or just someone that's looking to have a little bit of fun, you're sure to find something that excites you. There is an assortment of slot machines, table games, and even poker tournaments to participate in. The prices range for both slots and table games. You're winning from slots are paid with a voucher which you cash in for real money. Winnings from table games are paid in chips which you cash in for real money. You can try out some of the games for relatively cheap but, if you're unfamiliar with them, it's always best to watch other's play or ask for assistance from a dealer at an empty table. The slot machines all have instructions on how to use them as many can be quite confusing. Aside from the casino, The Venetian has a ton of entertainment so you'll never get bored. There are two nightclubs - Lavo and Tao - as well as several lounges and bars. The Venetian also offers a number of first class shows including concerts, exhibitions, and a variety of stage shows. Whatever you choose to do, you'll have an amazing time. Every performance is amazing and they really go out of their way to show you a good time. If you're into sightseeing, The Venetian offers "Maverick Helicopter" tours and "Pink Jeep" tours. You can also choose to relax at the Canyon Ranch SpaClub or in one of the fabulous pools. Finish off your day with a nice cappuccino and you're set! The Gondola Ride at The Venetian is an amazing experience that brings the excitement and romance of Venice right to the Vegas Strip. You can enjoy a gondola right for yourself with either an indoor ride or an outdoor ride. Whether you're with a loved one, a friend, or even by yourself, you'll love this unique experience. Everyone that I've ever spoken to that has taken a gondola ride at The Venetian has an absolute blast. Not all of us can make it to Europe, but we can still get a little taste of it. Vegas has something for just about everyone and it owuldn't quite be the same without The Venetian and it's gondola ride. Awesome and worth it! Have You Stayed at The Venetian? I am planning on staying there in the future. shiningirisheyes it is absolutely gorgeous and the gondola ride is really nice and was a great experience for sure. This sounds spectacular but my first interest would be the gondola ride. Beautiful decor int he Venetian, amazing architecture, the ceiling looks awesome. 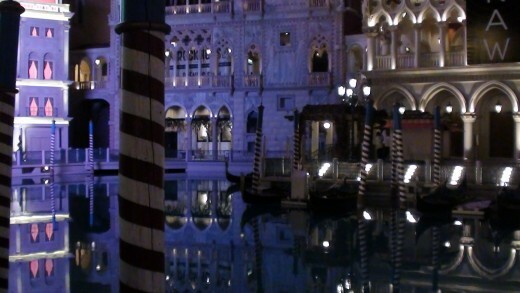 The venetian was amazing! My husband fell in love with the bathroom and started imagining a remodel of our own bathroom to match. It was being able to soak in a bath while watching TV that did it for him. We did the gandola. Romantic.